Toronto, ON: Dundurn Press, 2008. 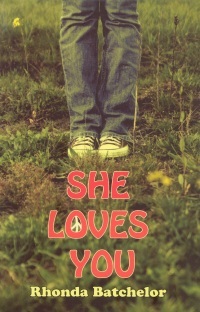 Rhonda Batchelor's first juvenile novel, She Loves You, flashes back to 1969 to give an engaging portrait of 14-year-old Annie Ward's life. Annie, after leaving the school for the gifted where she thrived in every way, begins a new and less encouraging life in her high school. Annie's new world presents her with all the issues that young people confront every day– bullying, sexuality, alienation– but she finds herself navigating these waters largely alone, albeit with rare appearances from a few individuals who catalyze and impact her discoveries in different ways. Annie is still mourning the loss of her father and the abandonment of her only true friend, Zoe. She lives alone with her mother, and although the two have a nurturing relationship, Annie begins to isolate herself from everyone when rumours of her supposed sexual orientation start to fly. When chatter leaks to the school administration, Annie is called in by the school counsellor, Mr. Manning, who questions Annie as to her friendships and home life, requesting that she start writing in order to begin working through her problems. Annie is not convinced that she is the one with the problems, but she remains open to the idea of writing out her thoughts, and she begins to see the potential of writing to enable a person to remain true to him/herself. Writing and the Beatles become Annie's tools of self–assertion. Annie is smart and has a certain confidence about who she is and what she will stand for. She has no desire to join the cool kids nor align herself with bullies who feed off of each other's insecurities. Lonely and often drowning in her self-dialogue, distancing herself from all including her beloved mother, she remains firm in her values and never seems to consider compromising her core. She is indeed resilient, but this is not easy because she is sensitive and full of teenage angst, desiring to connect with real people and forge meaningful relationships. She is soon drawn to a local group of hippies, an action which sets her off onto a sort of double-tracked life. She Loves You is a coming of age story, set in the Sixties, when 'daring to be different' summed-up human aspirations for many. Part of Batchelor's goal with this book is to challenge this assumption. Batchelor seems to be claiming that this era was not all about free love and justice; that even hippies were capable of prejudice and bullying, that there was still much social injustice despite what we tend to think. Batchelor has troubled Annie ironically emerge as one of the few open-minded and compassionate individuals in her world. Although Annie is branded with many labels– half-orphan , lezzie – she is all the while ever exploring how and in which way or ways she may want to brand herself. She does not judge social deviance, though neither does she get swept away with drugs and bohemian romanticism. She remains witty, insightful, and very strong. Literature for children and young adults should reflect the complexity and trials characteristic of their age, but it should also ultimately celebrate young people's resilience and desire to be their own. She Loves You succeeds in this. Any young person who has felt different or who has craved options beyond what they see in their high school environment will appreciate or at least relate to this book in some way. A few areas could have been more thoroughly developed. At times, the insertion of the narrator's voice seems forced and erratic. The reader craves more of Annie's own voice and less narration. Also, Annie's acceptance of her guidance counsellor needs more credence. She opens up to him too quickly. Last, we all know better than to judge a book by its cover though, admittedly, this book sat at my desk untouched for too long only because of its tacky sixties-chic cover with its bland photo and red bubble font which convinced me that I was about to read a despondent girl's diary about world peace. The cover needs revamping because no one would know that the story inside is actually much more exciting. Otherwise, She Loves You is a memorable story with characters that are real and messages that resonate. Danya David is a graduate of UBC's Master of Arts in Children's Literature program.